Ford will officially launch the new EcoSport next week. The revamped model gets a revised look that echoes the Kuga, a vastly improved interior plus there's a new 1.5-litre diesel engine. 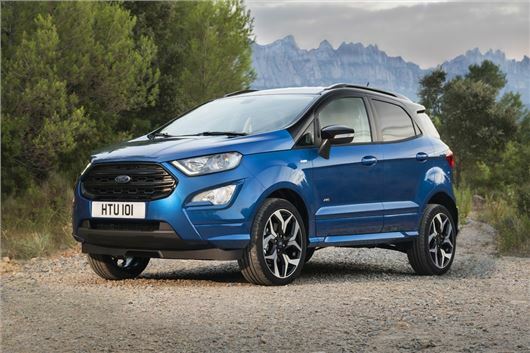 It will go on sale late this year and we expect a slight increase on current EcoSport prices which start at £15,645. There will also be a new ST-Line model, shown in the pictures here, as Ford aims to boost sales of its small crossover which have trailed behind competition like the Vauxhall Mokka X. The updates to the styling, helped by the fact the EcoSport lost its tailgate-mounted spare wheel and cover in 2015 (although it's still available as an option), should certainly give it more appeal. There are 12 paint colours to choose from along with a new contrasting extended painted roof option. Other additions include new 17-inch and 18-inch alloy wheels. However, the biggest changes come inside with a completely new interior similar to that in the recently launched Fiesta. Ford promises new levels of refinement, better controls and more soft-touch materials. Plus there are new seats optimised for greater front and rear occupant comfort. Other new features include a height adjustable boot floor and a new centre console with a built-in folding, sliding passenger armrest. Plus there's now a 4.2-inch digital instrument cluster. A new 1.5 EcoBlue diesel engine delivers 125PS and 300Nm of torque with claimed fuel economy of more than 60mpg. It will initially be available with four-wheel drive with a front-wheel drive model following in mid 2018. The engine line up will include a 100PS version of the 1.5 TDCi plus the impressive EcoBoost 1.0-litre engine available with 100PS, 125PS or 140PS. Ford is adding a new six-speed manual gearbox too. Tweaks to the suspension springs and damper should improve the ride and handling plus there alterations to the power steering assistance.